House audio distribution is a segment of home automation that allows many different rooms of the house to access the same centralized audio sources. 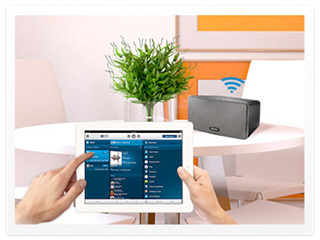 Whether it is an iPod, satellite radio, AM/FM radio or a music server, all of these devices can be accessed from any room that is part of the system. Imagine music playing throughout the house during a party. Taking that a step further, different sources can be accessed in different rooms at the same time. The radio can be playing in the den while the iPod is playing on the patio, while XM is playing in the Master bedroom, etc. Control can be a simple push button keypad that allows volume control and source selection. Or it can be more sophisticated with a display that shows the play-lists on the iPod and which radio station is selected.